In 1984, this groundbreaking book presented a chilling profile of the criminal mind that shattered long-held myths about the sources of and cures for crime. Now, with the benefit of twenty years’ worth of additional knowledge and insight, Stanton Samenow offers a completely updated edition of his classic work, including fresh perceptions into crimes in the spotlight today, from stalking and domestic violence to white-collar crime and political terrorism. When I saw Inside the Criminal Mind on Blogging For Books, I was stoked. I find criminology fascinating (I work in law enforcement) and this book did not disappoint. In fact, I found myself being the obnoxious non-fiction reader who tells everyone within earshot the various theories and ideas I read. The book was first published in 1984, and this is the revised edition. It’s updated to include examples such as Columbine, Newtown, and updated studies. Though crime has evolved, to include more school shootings, domestic violence, and social media, the way that we deal with crime hasn’t changed that much. The book proposes that in order to reduce the rate of recidivism (recidivism is when someone reoffends) we must understand why a criminal chooses to commit a crime. How often to we blame someone’s criminal background on their childhood? We assume their parents weren’t involved or around. We blame it on poor education, low social standing, and violent video games. This book argues these points, and provides case studies to back it up. Samenow argues that two kids from the same household will come out different—one will be a criminal, and one a good citizen. Plenty of people with poor education and social standing rise above it, and several become criminals. Lots of kids play violent video games or watch gory movies and don’t go on to kill people or beat them up. This book was fantastic. It was well-written and organized. It was easy to read, and I found myself really thinking about the ideas Samenow posed—it completely threw me off of everything I ever thought. I liked that his theories are backed up with real case studies. I would definitely recommend this book to anyone with an interest in criminology or psychology. However, I rated it a 4/5 on Goodreads because I felt that it was pretty one-sided. 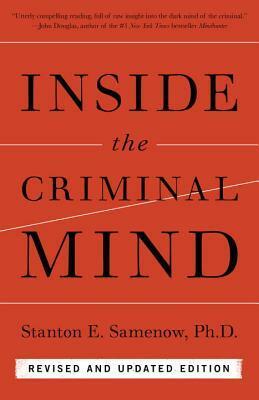 I received a copy of Inside the Criminal Mind for free in exchange for an honest review from Blogging for Books. Find it on Amazon or at Barnes & Noble.